It's not clear if the Tahini enhances the eggplants, or the eggplants enhance the Tahini. One thing is certain, however: together they are a true delicacy. Fire-roast eggplants on all sides until scorched, and place on netting, or pierce eggplants with a skewer or fork and roast in an oven preheated to a grilling temperature for 20 minutes on each side. Split tomatoes in half and remove juice and seeds. Grate with the coarse side of grater and mix with the remaining ingredients. 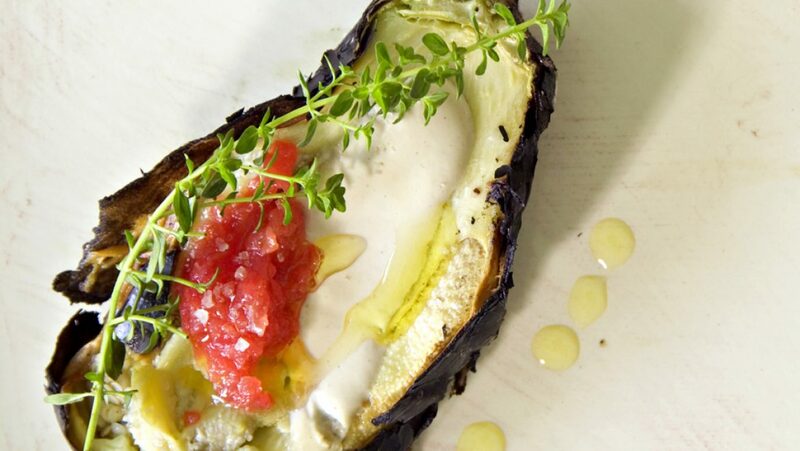 Split eggplants in half, and pour a dash of Tahini and tomatoes into each half. Serve eggplants while still warm.